Over the long weekend, I had a chance to head back to Point Mugu State Park to see how the area had fared after the Springs Fire. 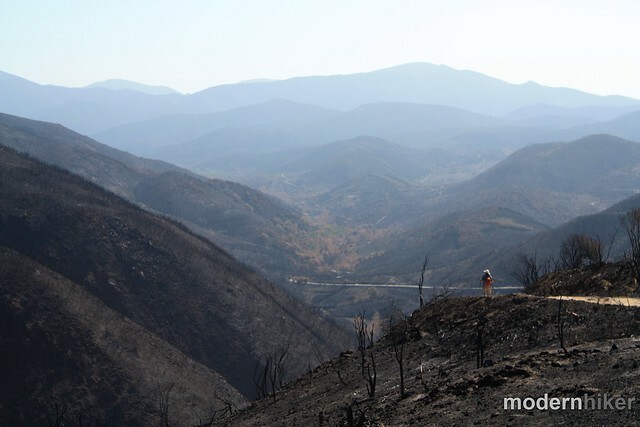 Starting on May 2nd, the fire burned over 24,000 acres – and from the burn area maps released, it looked like virtually ALL of Point Mugu State Park was on fire. 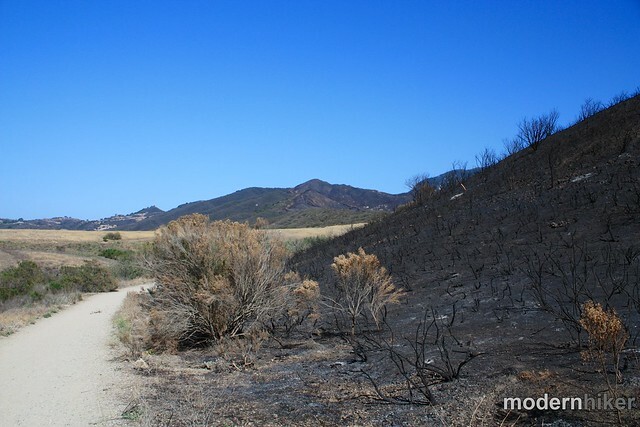 Before the long weekend, officials in the Santa Monica Mountains and Point Mugu made the surprise announcement that ALL of the trails in the park were re-opened and I’ll say that my first impression was that it’s going to take some time – but I think the area will recover nicely. When I first entered the park, one of the things I noticed as much as what was burned was what wasn’t burned – firefighters did an excellent job of keeping the fire away from the Satwiwa Nature Center and looked like they used the trails between the center and the trailhead as their border. On one side, everything is burned – on the other, lots of green. The other thing I noticed immediately is that the park is REALLY doing its best to make sure you know what’s going on there – right at the entrance at Via Goleta, there’s a large sign informing visitors that the park is, indeed open – but that access may be restricted to certain routes. Similar signs are posted near the parking areas and entrances to the park. It’d be really, really hard for someone to wander into the area and not know what the rules are. 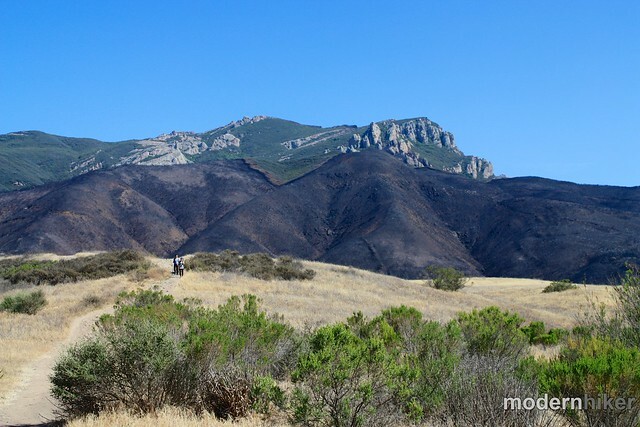 Looking toward Boney Mountain, I was struck at the different view – some of the grassland in Rancho Sierra Vista is still there, while other sections have been charred completely black. Looking up at the mountain, you can see the thick burn area that, thankfully, didn’t make it to the mountain itself. Sycamore Canyon – known for the lush, green canopy over the intermittent babbling brook – has been drastically altered. While pockets of leaves remain, most of the landscape is charred beyond recognition – especially in the Upper Canyon. Looking further downstream, it appears that areas closer to the water escaped with the least damage – although many trees were still singed and may not recover. 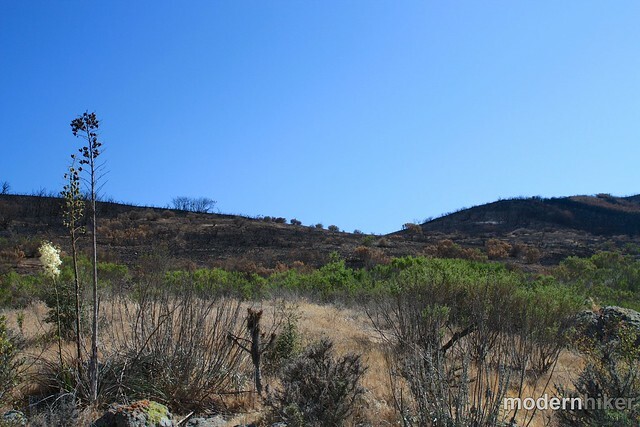 There is good news, though – only a few weeks after the fire, many yuccas had already started to re-sprout from their crowns and some grasses and small plants had begun pushing up from the devastation, too. I was also heartened to see just how many people were out enjoying the park even in its burned state. 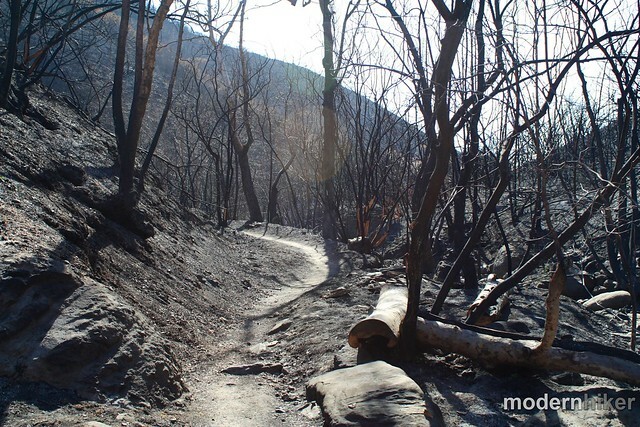 There were lots of hikers and bikers out – some just to take pictures, some intent on enjoying their favorite trails anyway, others there with kids using the opportunity to show them how SoCal landscapes are affected by burns. If you were thinking about heading out to Point Mugu for a hike, know that the trails are still in remarkably good shape. Other than a few areas of loose soil, crews have already done an excellent job of removing most of the large trail obstacles and keeping footpaths passable. From what I saw, anything that’s off-limits is very clearly marked as such. Know that a lot of what you may have loved about this park is gone – for now – but what remains is an invaluable opportunity to see, up close and personally, how a landscape recovers after a wildfire. For more photos of the Springs Fire Burn Area, here’s a Flickr slideshow of my images. 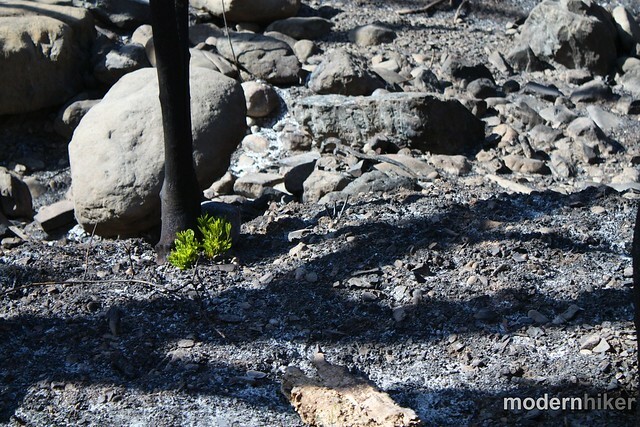 A friend of mine was hiking in Serrano Canyon last month and was amazed that it did not burn like Sycamore did. even though the trail to Serrano was a mile up Sycamore Canyon. Can anyone explain how Serrano fared better in this drastic fire? I'm not certain what fire does to a tick population ... however, I do know that Lyme disease-carrying ticks have been found in Southern California. They are extremely rare, however, and probably rate near your chances of being attacked by a mountain lion or rattlesnake on the trail - which is to say you probably don't have to worry about it. I'm a New Englander and we have Lyme Disease awareness drilled into us from an early age, which is why I'm probably more cautious about ticks than most Californians. That said, you can take some pretty easy steps to counteract them here. Wear light clothes so you can spot them more easily, tuck your pant legs into your socks if you're wearing long pants, and stop to do a quick check whenever you hike through an area of tall grass. They're slow critters, so it takes them some time to actually bite you - and even if they have already bitten you it usually takes 24 hours for any disease agents to enter your blood stream. Pulling a tick out with tweezers is gross but relatively easy. If you can't, just go to a doctor - DON'T try to light it on fire or put alcohol on it or anything like that. Hi Casey - do you think the fire changed the tick situation? Is the tick population smaller or larger? Has anyone ever done any research to learn whether or not the ticks at Mt Boney / Pt Mugu State Park carry Lyme disease? I noticed that you mentioned ticks in your earlier post and I am just curious. I'm born and raised in So Cal. Never thought about ticks, ever. Learned about how bad they can be on the East Coast. I'm doing a lot of trail running and wondering if I should be concerned at all. I hiked here today and I was impressed by the way everything is growing back, the wild flowers are blooming and today's weather was perfect, off shore winds and 70 degrees at the top of the peak. Casey I came across your blog just searching for trails and I have hiked a few already as I am new to hiking, your information and directions makes it easy to follow, keep up the great work!! Sounds lovely - Thanks for the wildflower update! As of April 20, 2014, abundant wildflowers on the lower reaches of the Backbone Trail - between the day use and group camping areas. As you climb to the Overlook Trail, the flora changes, but remains abundant. Plenty of re-growth of grasses, manzanitas, and low shrubs. Oaks and Sycamores in at least partial leaf, even with hollowed-out trunks. Any idea how the campgrounds fared? We were planning a camping trip to Sycamore Canyon but given the destruction I think it's best to wait until next year. I hiked up to Tri-Peaks the other week after the fire. it's pretty amazing. 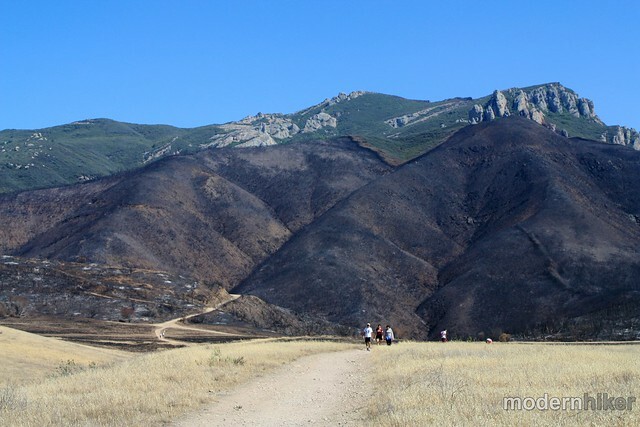 The bowl by Sandstone Peak is totally unscathed, but when you approach the Tri-Peaks you realize just over the ridge everything is burnt to a crisp. I didn't venture down backbone trail, but you wouldnt even have been aware if you didn't venture a little further than the mishe mokwa loop. Thanks for the response and additional info, Kate! That's great news about the trees, too - I'm not a botanist but it looked like a lot of those sycamores and oaks weren't too badly burned, and I could already spot some manzanita sprouting near the ground. Thanks to you and everyone else at Mugu SP and the SMMNRA for your hard work in getting the park back on its feet so quickly. Thanks for sharing this, Casey! We're so glad to know that you felt the signage and information is clear. 1. According to other park staffers (I wasn't here then), the reason Solstice Canyon had to remain closed much longer was because of the steep hillsides and safety issues surrounding that. Rancho Sierra Vista and, to a lesser extent, Point Mugu State Park have significantly different topography. 3. Serrano Valley was hit pretty hard by the fire (see above Flickr set for photos).